Looking over the great escapes website, it does not look like the alpine bobsleds are on the fast lane list. Is this info correct, or am I reading it wrong? If this is the case, I'm surprised by it. ^It is indeed not on the Fast Lane rides ; tbh considering how bad the capacity is on this coaster, and that the wait is already awful enough, allowing Fast Lane on it would be a terrible idea. Is there a reason they run that thing the way they do? La Vibora rolls trains like crazy in the same chain. When we went to Great Escape, they wouldn’t send a train until they were triple stacked despite the fact that the ride has 11,000 block sections. 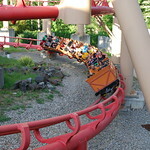 coasterbill wrote: Is there a reason they run that thing the way they do? La Vibora rolls trains like crazy in the same chain. When we went to Great Escape, they wouldn’t send a train until they were triple stacked despite the fact that the ride has 11,000 block sections. Staffing, poor training, and poor maintenance are your answers. xVicesAndVirtues wrote: It doesn't get anywhere near as busy as the above parks, but operations are pretty slow and laid-back at this park. It can be the busiest day of the year and you might have a full station for the Comet, which might take 20 minutes max, and a 4 or 5 train wait for the Boomerang. The longest wait in the park is usually Alpine Bobsled. I haven't been to the park yet this year, but I know the past few seasons they've operated with just the front loading platform, which can make the wait take eons. I'd recommend doing it early because it also breaks down or goes down for light rain, then take your time with everything else. ok cool thanks, going with young kids so mostly going to be doing all the little rides, so i imagine the water park and slides are pretty fast to get on too? ^ The kids water play areas won't have waits, but some of the larger slides will if it's a warm weekend day. Unless it has changed, Alpine Freefall, Tornado, and Mega Wedgie are the ghree that get the longest waits. The parks website is listing the Alpine Bobsleds as temporarily closed. Any of you locals know any info on what's going on? John Peck wrote: The parks website is listing the Alpine Bobsleds as temporarily closed. Any of you locals know any info on what's going on? A worker told me that it has only operated 5 days so far this year. ^ If that's true, I fear the seemingly endless rumor of Alpine Bobsled's removal may finally come true. If that happens, they really need some type of steel coaster to compliment Comet. It's pretty sad that a bobsled that has been relocated twice is the best steel coaster there, but just look at the competition.